Ana Reyes works as a Customer Care Ambassador at Better World Books where her caring personality has an opportunity to shine. Reyes’ job is to help customers with issues that arise such as tracking their orders, fixing an order that was shipped incorrectly, helping expedite orders and helping customers who might need assistance placing an order. For Reyes, the biggest challenge in her day to day work is turning a bad situation around. Sometimes mistakes happen and problems arise. She finds satisfaction in helping resolve those problems to make customers happy. She likes being able to take the extra steps to help resolve issues in a way that works best for the customer whenever possible. She wants customers to know that they aren’t just a number and that they are being listened to. “In customer care, we are the voice of customers,” says Reyes. “Nobody else [in the company] really gets to know what customers are saying.” She adds that they will make those problems known to other departments to help prevent future issue. 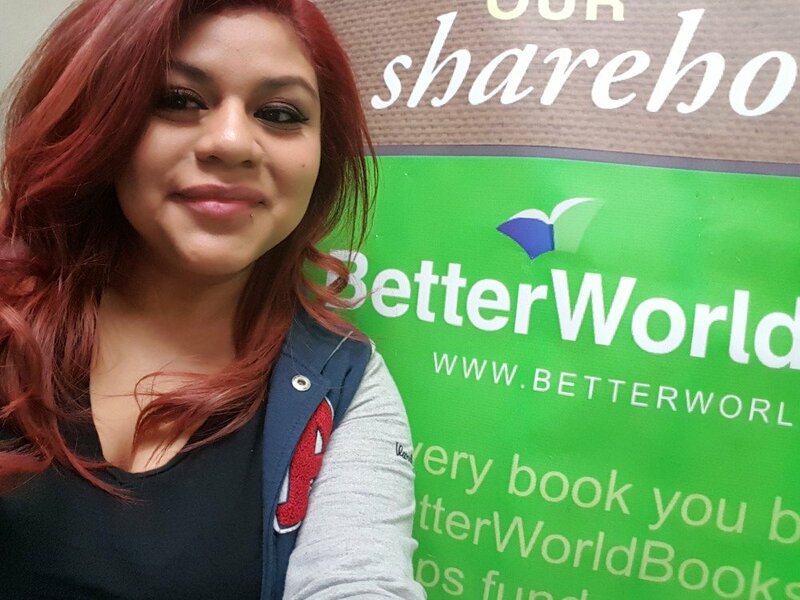 Reyes doesn’t just enjoy helping customers, she also enjoys the collaborative and open work environment at Better World Books. “[I like] the people I work with. And it’s not just the people in my department. I work with a lot of good people and friendly people,” says Reyes who values being able to ask people in other departments to help solve problems and find creative solutions. The caring focus of Better World Books also stands out to Reyes who values working for a company that actively reaches out to help people globally and locally. “None of the places that I’ve worked at have had a program where we, as a company, are involved in charities,” says Reyes. Reyes has participated in a few company volunteer events including one to help create comfort vests for children with autism, which she said particularly stood out to her. She also appreciates that Better World Books brings in other opportunities such as on-site blood drives, which make it easy for employees to give back while they are at work. The caring touch Reyes brings to her work is not only noticed by customers, but also by her coworkers. She has several times been named “Most Valuable Bookerfly,” which is an employee-nominated honor given to those who exceed expectations by going above and beyond in their work.